Oooh, this is one of the creepiest pictures of Biff ever, I think! And it looked even more creepy before I had actually read the caption/description! Hahaha! Well done! You think Biff would have known in time to at least get the harmonica away from his mouth…. My dad once told me about a film he saw of a guy eating spaghetti that was played in reverse. Creepy. 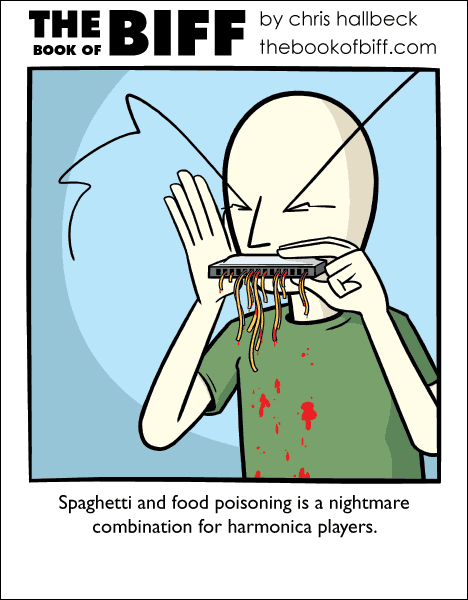 I immediately thought of Survivorman once you said ‘food poisoning’ and ‘harmonica’. Somehow I doubt there’s an episode where he stumbles across a pasta-beast, however. For a minute, I thought he was playing a blues song for Cthulhu.